'I'm just a bean guy," says Gordon Hamersley, who loves cassoulet, the wintry dish of tender beans simmered with chunks of flavorful pork and garlicky sausage. It's the kind of comforting, cold-weather food that makes the chef, co-owner of Hamersley's Bistro, very happy. Cassoulet (pronounced ka-soo-LAY), a rustic dish from the southwest region of France, is relatively inexpensive to make and rewarding with its rich, satisfying flavors. It's poor man's cooking - not unlike New England's baked beans. That comparison might appall French cooks, but cassoulet is essentially a ragout of white beans, humble cuts of meat, and a few herbs. After the beans and meat have cooked slowly, the essence of garlic and salty pork prevails. 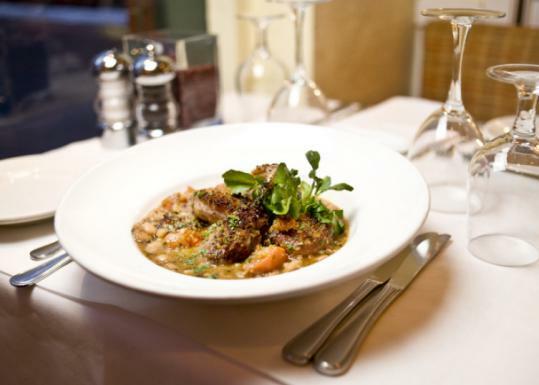 Cassoulet is offered at Hamersley's in the South End and the chef's recipe is featured in his cookbook, "Bistro Cooking at Home." "I like being able to keep these traditional dishes alive," says Hamersley, who credits author Paula Wolfert as an influence, specifically, her well researched "The Cooking of Southwest France." In that volume, Wolfert writes that cassoulet is the quintessential dish of the region and there is plenty of dispute as to how an authentic cassoulet should be made. (Consider it similar to the argument over whether pizza crust should be thick and chewy or thin and crackerlike.) As the key cassoulet ingredients and their proper handling cause "endless drama," writes Wolfert, they warrant attention. The main ingredient is the beans. "The right bean can totally transform the dish," says Hamersley. He likes the classic French Tarbais beans or pale green flageolet; otherwise opt for small, white cannellini beans. Of course, the beans must be dried - never canned. After cooking, says the chef, they're "tender and creamy without losing their identity and texture." As for the meats, that probably depends on whether you want to keep to the humble origins of the dish or include the traditional confit, now available ready made. The more commonly used meats are chunks of fresh pork, pig's knuckle or ham hock, garlic-flavored pork sausage, cured pork belly, pork skin, and preserved goose or duck. Some variations include lamb. These are meats that must be coaxed into tenderness with long, slow cooking. If your budget allows, duck leg confit brings rich flavor and ups the meat-to-bean ratio, giving folks something more to chew on. The meat can be pulled off the bones in large chunks and mixed into the beans, or the legs can be heated separately and served on top of the cassoulet. Only a few herbs are suitable for the dish: "Cassoulet shouldn't be a spicy dish," says Hamersley. "The flavors should be comforting." Thyme, marjoram, parsley, and bay leaf are all that's needed. To top the dish - traditionally a coating of bread crumbs - some cassoulet cooks prefer a crisp, crumb coating that covers the casserole; others use fewer crumbs and fold them back into the ragout to add bulk to the sauce. (Wolfert's recipe calls for just 2 tablespoons; Hamersley uses 2 cups.) What's important, says Hamersley, "is to use thicker, homemade crumbs or panko because they have more texture." The stew will absorb anything too fine, making it thick and sticky, he says. With all the highly seasoned meats, salt may not be necessary. Bacon, sausage, and confit all contain salt; wait to season the dish until the end of cooking. And no discussion of cassoulet would be complete without mentioning the consistency, which can range from soupy to thick to dry. That depends on how much broth you start with, how much liquid the beans absorb during cooking, and whether the bread crumbs are allowed to soak up some of the sauce. "The middle ground between soupy and dry" is how Hamersley describes his version. "It should have a velvety texture." Cassoulet shouldn't have so much liquid that you can't eat it with a fork, he says. While cooks have much to argue about, the one thing they agree on is that the dish is best made over a few days, which allows time for the flavors to develop. "The whole thing should come together as one glorious experience," says Hamersley. Tarbais beans or pale green flageolet are available at Wilson Farms, 10 Pleasant St., Lexington, 781-862-3900 and at www.purcellmountainfarms.com or www.bobsredmill.com. Duck confit is available at John Dewar & Co., 753 Beacon St., Newton, 617-964-3577 and 277 Linden St., Wellesley, 781-235-8322; Lionette's Market, 577 Tremont St., Boston, 617-778-0360; or at www.dartagnan.com.